If you have ever had the Cinnamon & Sugared Almonds at Blizzard Beach, you know how addictive they can be. You might start by just popping a couple in your mouth, but after a few you’ll be grabbing them by the handful. 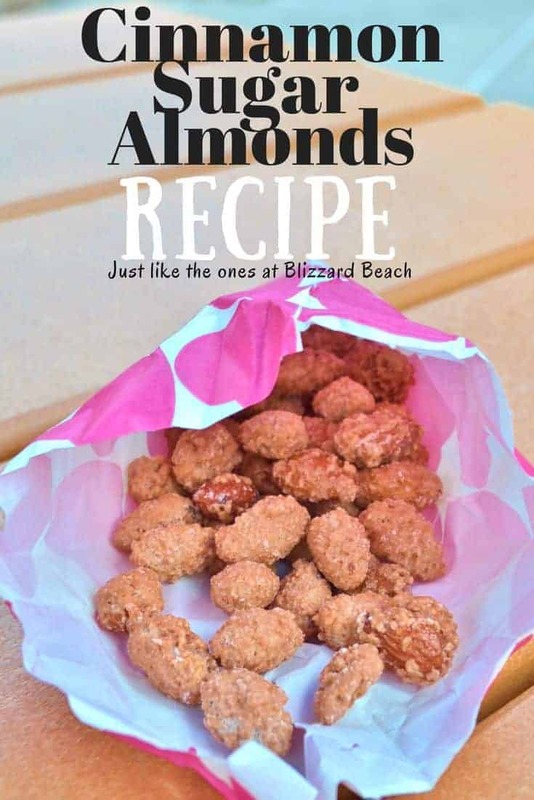 I looked high & low for the exact Cinnamon & Sugar Almonds Recipe that Blizzard Beach uses, but never could find one that seemed to have the same taste. After doing a few experiments with recipes, I feel like I have perfected a recipe for Crock Pot Cinnamon & Sugared Almonds that taste just like the ones you find at Blizzard Beach. They are very easy to make and taste amazing! The added benefit is that when you make these, your entire house will smell like this cinnamon goodness! This is an easy dump recipe for making Cinnamon Sugared Almonds in a Slow Cooker or Crock Pot. These will taste just like the ones you find at Blizzard Beach in Walt Disney World. Mix together all sugars, cinnamon, and salt & set aside. In a second bowl, whisk egg whites and vanilla. Add almonds to the egg white mixture and coat thoroughly. Pour almonds into crock pot & then add the sugar mixture. Stir to coat all the almonds. Turn the crock pot on low and cook for 3 hours. Stir intermittently. At hour 3, add water and stir. Allow to cook for one additional hour. Line a baking sheet or shallow pan with parchment or wax paper. Use a large spoon & spread the almonds onto the sheet to cool. Once cool, break into pieces and store in an airtight container. This is such a super easy crock pot recipe and one you can use over and over again and can be used with more than just almonds. Simply substitute your favorite nuts to make other versions like Cinnamon Sugared Pecans or Peanuts! We love to give Cinnamon Sugared Almonds as gifts during the holidays, to teachers during Teacher Appreciation Week and as housewarming gifts. Simply place on some wax paper inside a small treat box and you have a gift that will be appreciated because it was something you took the time to make from scratch. Just be advised that these should not be given to anyone that has or shares a house with anyone with nut allergies. Have you had the Cinnamon & Sugar Almonds at Blizzard Beach? If not, be sure to make these delicious treats and try them for yourself! MMMM I am totally going to make these!